Background: Inferences about long-term effects of therapies in multiple sclerosis (MS) have been based on surrogate markers studied in short-term trials. Preventing progressive disability is the key therapeutic goal but there remains no validated definition for its measurement in a trial context. Meanwhile, MS trials continue to shorten and to depend on unvalidated surrogates. Since there have been no treatment claims for improving unremitting disability, worsening of disability in the placebo/control arm must occur for effectiveness on this outcome to be shown. Methods: We examined widely-used clinical surrogates of long-term disability progression in individual patients with MS within a unique database from the placebo arms of 31 randomized clinical trials. Results: Detection of treatment effects in secondary progressive MS trials is undermined by noise in disability measurement. Whereas existing measures can be partially validated in secondary progressive MS, this is not the case in relapsing-remitting MS. Here, examination of widely used definitions of treatment failure demonstrated that disability progression was no more likely than similarly defined improvement. Existing definitions of disease progression in short-term intervention trials in relapsing-remitting patients reflect random variation, measurement error, and remitting relapses. Conclusion: Clinical surrogates of unremitting disability used in trials of relapsing-remitting multiple sclerosis cannot be validated. Trials have been too short or degrees of disability change too small to measure the key outcomes. These analyses highlight the difficulty in determining effectiveness of therapy in chronic diseases. The natural history of multiple sclerosis (MS) evolves over 30–40 years.1 A secondary progressive phase (SPMS) supervenes in >80% of relapsing-remitting (RR) patients. After 15–18 years, 50% of patients need assistance to walk, are confined to wheelchair or bed, or have died, but substantial variation occurs.2 Reports that continue to appear extrapolating beneficial treatment effects on short-term surrogate markers3 to long-term outcomes epitomize problems common to many chronic diseases. No therapy has claimed improvement in disability and therefore worsening in placebo arms is fundamental to showing treatment effects. Unremitting disability, the key therapeutic target in MS, embodies its prime social, economic, and medical impact and characterizes the progressive phase of the disease, which begins on average a decade after onset. Relapse frequency, changes in short-term disability scores, and MRI are still unvalidated surrogates for unremitting disability. This and the lack of a consensus definition of disability accumulation, even among trials leading to regulatory approval, motivated the assembly of independent databases from randomized trials and from natural history populations. Several therapies shown to favorably affect relapse-related clinical and MRI outcomes,4,5 were approved because they affect outcomes we evaluate here. Changes in these surrogates for unremitting disability accumulation have heavily influenced therapeutic decisions, including claims that placebo-controlled trials are now unethical. Steps toward identifying reliable surrogates of long-term disease progression entails appraising those currently employed. We asked if changes in disability scores used in trials mean unremitting disability, a question critical to risk-benefit considerations, not to mention patient expectation. The Sylvia Lawry Centre for Multiple Sclerosis Research (SLC) was established to accelerate the development of effective therapies through independent research. It has collected a unique database consisting of the placebo arms from 31 treatment trials. See http://www.slcmsr.info for a listing. Analyses based on the assembled SLC data set of RR and SP patients include the placebo arms of major trials carried out over the last decade. These datasets were donated by the principals in these trials. Following principles laid down soon after the center was conceived, data have been split randomly into three parts: 1) open (40%; 1,344 patients), 2) closed (50%) as reservoir for replication studies, and 3) reserve (10%). Clinical trials were of 1–5 years duration (most <2–3 years) with 3–6 monthly assessments. Trials were heterogeneous in frequency of visits and length, with occasional missed or unrecorded scores. Many trials in the database were too short to assess impact on disability when definitions for sustained change required 6 months of confirmation. However, the major trials in the field were represented. Staggered entry made follow-up durations variable within individual trials. We defined three data subsets prior to analysis in order to adequately cover the various definitions of disability worsening used in major pivotal trials, the lack of completeness of assessments in some studies, and the simplest measure viz that of entry vs exit scores: Subset 1—RR and SP patients observed for ≥15 months, having uninterrupted serial assessments every 3 months (±1 month) with baseline EDSS ≤6.0, in order to compare different definitions of time to sustained progression. Subset 2—all patients having baseline scores and one observation at 2 years (±1 month) after entry into the study but without any further restrictions. Subset 3—subset 2, but excluding those who had had measurements taken during a documented relapse interval. Subset characteristics are listed in table 1, by RR and SPMS phenotype. Of 1,344 placebo patients in the open dataset, 425 patients entered subset 1 and 516 entered subset 2. Exclusions largely were composed of trial durations too short to qualify. Truncating data to simulate a 2-year trial minimized the impact of dropouts and exclusions which rapidly accelerate after this time. This was carried out for the most stringent definition of progression (1 point confirmed at 6 months) in an independent, randomly selected group from the closed dataset using the same selection criteria. We followed the definitions in RR and SP trials constituting the dataset. The development of the progressive phase cannot be confidently diagnosed in most patients until an Expanded Disability Status Scale (EDSS) of 3.5–4 on a 0–10 point scale is reached. There is good inter-rater agreement on scores of ≥4. These were the same definitions of unconfirmed or confirmed disability change of 0.5–1.0 EDSS points used in the trials constituting the database. Confirmation times of 3–6 months, plus an initial 3-month minimal period for change to register, shortened the effective period of observation. Few studies required additional visits after study conclusion, so only the last on-study visit could be used for confirmation. Definitions of placebo treatment improvement and worsening (treatment failure as defined in trials). Using the EDSS data from the trial placebo arms, we examined 1) 0.5 points minimum increase and 2) 1.0 minimum increase in EDSS. All changes refer to changes from baseline. Changes sustained at 90 days or 180 days as in the trials were deemed confirmed. These definitions of increased disability (worsening) were used to define treatment failure in many database studies. Improvement (not previously analyzed in reported studies) was a decrease in EDSS using the parameters as for worsening. To validate these definitions of disability worsening, we examined placebo arms from the 31 trials. Subjects were stable for ≥1–3 months at baseline. We reasoned that comparing the probabilities of worsening in disability vs improvement would measure how much worsening was attributable to noise from random variation/measurement error and other sources of fluctuation. What remained after subtracting the improvement from the worsening would be the real target of intervention, i.e., disability which does not remit. Data were also analyzed omitting the first on-study point, effectively extending the period of prestudy stability to >4–6 months. For selected outcome criteria we calculated numbers and proportions of events meeting each of the criteria. Since MS trials have used Kaplan-Meier curves to describe the progression of disability, we plotted curves of each definition of worsening and improvement and computed p values from a two-sided log-rank test. Additionally, one-sided Wilcoxon signed rank tests compared absolute differences in EDSS over 1–2 years. Clinical characteristics of the three database subsets in table 1 are representative of trial-eligible RR and SP patients. Mean and median entry EDSS scores were within 0.1 for each RR subset. The focus on subset 1 reflects the completeness of this dataset whereas subset 2 only required baseline and 2-year points and subset 3 excluded relapse-associated points. Defined EDSS change by time in study. Worsening (treatment failure) and improvement events in RR and SP for subset 1 without truncation are compared in table 2 for each of the six definitions using all available data. In SP, worsening occurred more frequently than improvement and was less likely to remit with increased stringency of definition. However, even in SP, improvement occurred approximately half as often as worsening (figure 1). For RR, however, event frequencies were similar for all definitions and sustainability was similar for less stringent definitions. Longer confirmation periods had fewer events and less likelihood of reversion, but only a trend is seen in this direction. The x-axes indicate days, and the y-axes indicate probabilities of not progressing or not improving by the definitions in A-F. (A) no confirmation period, half point; (B) 3 months confirmation period, half point; (C) 6 months confirmation period, half point; (D) no confirmation period, full point; (E) 3 months confirmation period, full point; (F) 6 months confirmation period, full point. We also investigated the distribution by magnitude/duration/confirmation of defined EDSS changes in SP and RR subgroups (table e-1 on the Neurology® Web site at www.neurology.org). The distribution of disability change by magnitude and polarity is not evident in the KM curves. Here treatment failure using a single specific definition is measured. For RR, worsening was not significantly more likely than improvement, even for 2-year definitions in subsets 1 and 3. Only for the 2-year definition in subset 2, which includes relapse-associated scores in the analysis and individuals with incomplete 3-month data points, was marginal significance reached. This did not survive correction for multiple comparisons (p < 0.07) (Wilcoxon test was not significant). The data for SP contrast with RR. Many more individuals have worsened for all degrees of change with fewer improvements, indicating diminished measurement noise at higher EDSS levels. 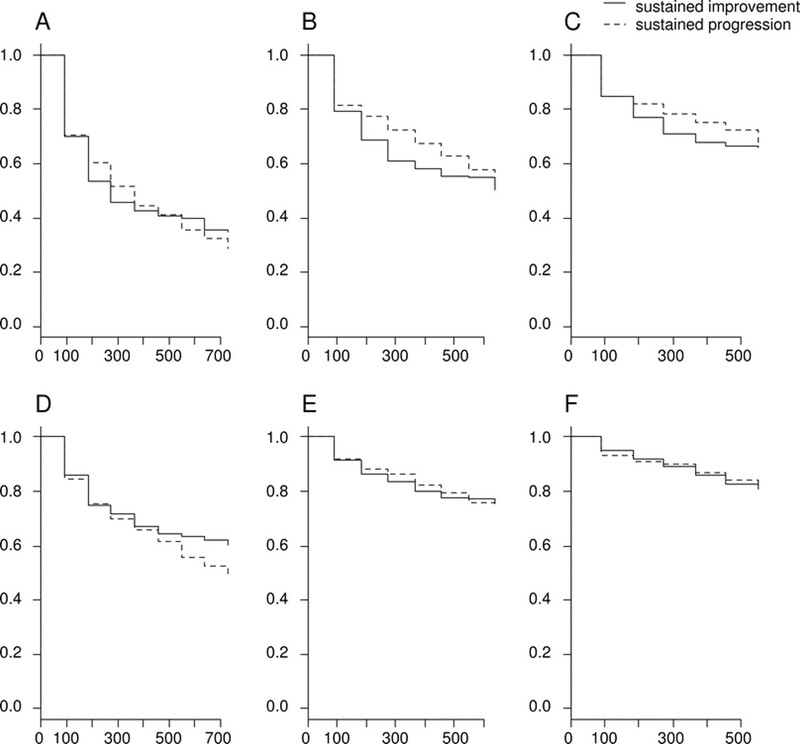 Survival curves for SP in figure 1, A through F, for the six definitions of worsening/improvement illustrate that sustained worsening is more likely than similarly defined sustained improvement. Table 3 shows that for all definitions of SP, worsening is significantly more likely than improvement using survival analysis (Kaplan-Meier) but improvement is common. RR survival curves in figure 2, A through F, do not significantly distinguish between worsening and improvement. High frequencies of sustained improvement in RRMS are seen for all definitions. By 2 years, half of placebo arm patients have a 0.5 point decrease confirmed at 3 months, only slightly less often than for sustained increase. Overall, the probabilities of ±0.5 and 1.0 point changes at the 3-monthly intervals up to 2 years are remarkably similar. For RR and SP patients, we truncated data at 2 years to simulate a 2-year trial, but no significant difference for RR is seen using all data points (table 3). Kaplan-Meier analysis assumes independence of the curves, not true here, as we are comparing different events in the same patients, but potential overlap between patients with worsening/improvement is limited by time constraints imposed by their definitions and by trial durations. However, the bias in this approach is in a direction unfavorable to our conclusion as is the case for the Wilcoxon test for EDSS change. Findings could have been an artifact of the specific EDSS levels reached. We hypothesized that if treatment failure definitions represented random noise/measurement error, we could run the analysis in reverse, taking the last EDSS point as the first and the first as last and find no difference. When this was done the relative survival curves for improvement and worsening were nearly identical (not shown). All observations were truncated after 2 years: x-axes indicate days, and y-axes indicate probability of not progressing/improving by same degree for the following parameters: (A) no confirmation period, half point; (B) 3 months confirmation period, half point; (C) 6 months confirmation period, half point; (D) no confirmation period, full point; (E) 3 months confirmation period, full point; (F) 6 months confirmation period, full point. We used the SLC closed data set to re-examine the most stringent measure we could test in RRMS, i.e., 1 point 6 month confirmed change in EDSS in subset 1. Again this was not significant—sustained worsening vs improvement (p = 0.184). In long-term diseases, it can be difficult to execute randomized clinical trials (RCTs) which reach hard unambiguous efficacy endpoints. Trials in MS are not unique in being dependent on short term surrogates for the key outcomes. Given the enormous practical therapeutic significance of demonstrable changes in widely used clinical and MRI surrogates, validation has been long overdue. In the studies we report here, the meaning of short-term changes in disability scores is addressed independently in RR and SPMS. Disability has typically been measured on the familiar10-point ambulation-centered scale (EDSS, where 0 is normal, 3 mild disability, 6 cane requirement, 7 wheelchair use, and 10 is death from MS). Serial in-trial upward changes of 0.5 and 1.0 point on this scale, confirmed at 3–6 months or unconfirmed, have been used as primary and secondary outcome measures. Beyond 2–3 years, disability outcome data have been unavailable6,7 or dropouts have compromised interpretation.8,4 SPMS is characterized by more advanced EDSS levels where variation is less than in RRMS,9 but the course of SPMS has been largely intractable.10-12 Keeping randomized clinical trials intact beyond 2–3 years has been difficult in this condition where childbearing and switches of therapy often interfere with following treatment protocols. We show in a database of RCT placebo arms that many patients who meet disability criteria for treatment failure in MS trials must do so by random variation/measurement error. For quantification, we compared worsening to improvement, each defined by the same magnitude and duration of ± confirmed disability scale change during the trial. Results support scale-dependent definitions of treatment failure used in SPMS trials to a degree. Nevertheless much variation is seen, some derived from inconsistent patient performance within the symptomatic spectrum of disease. To the extent that sustained improvement is a measure of noise/measurement error unrelated to unremitting progression, more than half of treatment failure events in placebo-treated progressive cases are offset by improvement events. RRMS analyses magnify the SP results. Although requirement for greater change on the scale and longer confirmation intervals did increase specificity of treatment failure definitions, no clinical measure of disability we evaluated can be supported as measuring unremitting disability in RRMS. Changes of 0.5 points are unambiguously invalid, even confirmed at 3 or 6 months. Similarly, 1 point changes were not significantly more likely to occur for worsening than for improvement although a trend appears in the expected direction. Survival curves were almost superimposable for all definitions and worsening vs improvement comparisons showed no significant difference. The course of RRMS is eventually manifested by near inevitable sustained upward movement on the scale but 2 years in trial-eligible patients may be insufficient to show it. For disability levels characterizing patients in trials reporting effectiveness in RRMS, interrater variation is ≥1 point 40% of the time.9 Nevertheless, 0.5 or 1 point changes4,5,13 have defined treatment failure for Kaplan-Meier curves in several pivotal trials. This conflicts with recommendations from the designer of the scale14 and with general considerations about precision and accuracy. Measurements of changes smaller than the variation intrinsic to the tool/object are inappropriate at best. We did consider that the findings reflected ascertainment idiosyncrasies of RR trials. In these, pretrial disease stability was usually required for 1–3 months, a duration insufficient to eliminate spontaneous improvement from recent relapse within the early trial period. However, after excluding the first data point and effectively extending stability out to 4–6+ months for most cases, the relative survival curves for improvement and worsening were essentially unaltered. Furthermore, removal of values taken during identified relapses had little if any impact on findings and conclusions. Furthermore, running the disability scores in reverse for Kaplan-Meier analysis made no difference to the results, strongly suggesting that disability variation measured in these placebo arms was unrelated to true disability change and was derived from rater and subject. Preanalysis division of the SLC dataset into two components (open/closed), separately and serially analyzed, allowed for replication. Natural history studies show that unremitting change requires an elapsed year for confirmation18 and in-trial times less than this have been associated with a high rate of spontaneous reversion.2,19,20 The findings seem to mirror interrater variability9,21,22 with implications for future trial design. Accepting random variation/measurement error as treatment failure surely diminishes the power of studies to detect effectiveness and increases vulnerability of study conclusions to the bias of imperfect blinding.23 It is likely that measurement errors of disability are often derived from inconsistencies in both. As such, they may be blinding influenced. Blinding success is infrequently measured but in several large studies of approved therapies, side effects are well known, detailed in consent forms, or have been readily available through electronic media. Since measurement accuracy varies inversely with both variance and the square of bias, blinding success deserves more attention as a potential confounder of trial results. Despite oft-repeated claims that EDSS disability measures are insensitive to change,24 the reduction of measurement error, accounting for unblinding and extending the duration of trials while keeping participation intact, are the more formidable obstacles to valid conclusions. The scale used to measure disability in MS trials may be too sensitive as used. We see little justification yet for ever-enlarging sample sizes of progressively shorter duration in MS trials. Chances are increased, if not ensured, of detecting statistical changes in unvalidated surrogates with uncertain clinical meaning. A recent suggestion that relapses produce persistent disability16 was based on follow-up periods measured in days and less than the intervals between visits which characterized trials in the present report. Treatment recommendations are now being made on the basis of trials with much less information since the pivotal interferon study,25 recently exemplified by a trial of 32 weeks duration26 and 607 participants. A recent regulatory decision rested on surrogate markers and p values in 12-month data,27 clinical results published at 6 months in a sample size of >1,000. In contrast, we have had difficulty in 2-year placebo data showing more worsening than improvement for disability outcomes currently used. The observations in this study might have been apparent within individual trials had the primary data from larger studies been with the investigators or in the public domain, thereby mandating the use of harder outcomes. Regulatory agencies could tie licensing of drugs for long-term diseases to mandatory follow-up of the original trial cohorts. This was unsuccessfully proposed in MS.7 Opponents are reminded of the wide acceptance a decade ago of the disability outcomes these studies could not validate.28 Which disability outcomes should be relied on in future MS trials? Increases in the degree of disability change and in the duration of confirmation seem essential for meaningful disability results in RRMS and 1 year duration of confirmation of at least a 1–2 point change will be needed based on this study. We emphasize that we have not had access to treatment arm data and that our studies do not contradict well-documented, short-term reductions of relapse rate and MRI T2 reported in RRMS trials.16 Assessment of these short-term surrogate markers for unremitting disability is in progress. George Ebers is the Action Research Professor of Clinical Neurology at the University of Oxford. Martin Daumer is the director of the Sylvia Lawry Centre, and he and Christian Lederer coordinated data accrual. John Noseworthy is a professor of neurology, Medical Director of Development at Mayo Clinic, and Editor-in-Chief of Neurology®. This study was conceived by C.L., M.D., and G.E. The analyses were done by C.L. and L.H. G.E. and J.N. (Chairman) were on the Scientific Leadership Council’s Scientific Oversight Committee at the time of these studies. G.E. wrote the first draft of the manuscript and coordinated the final version with input from all authors. The authors thank other participants in the SLC, the individuals and companies who donated their data on placebo arms with the expressed view of improving clinical trial methodology, anonymous private donors, and several national MS Societies including those from the United States, United Kingdom, Canada, and Denmark. They also acknowledge support from colleagues, especially Albrecht Neiss, Sir Iain Chalmers, and Margaret Esiri, who provided critical comments on the manuscript. Ingrid Kreuzmair supported the statistical analysis. e-Pub ahead of print on May 14, 2008, at www.neurology.org. Ludwig Heigenhauser is funded by the SFB 386 of the German Science Foundation DFG. The SLC acknowledges the role played by the Porticus and Hertie Foundations in providing financial support at a critical time enabling the completion of these studies. Disclosure: The Sylvia Lawry Centre was established so that data analysis independent of trial sponsors could be carried out.29 The authors report no disclosures. Received October 26, 2007. Accepted in final form February 4, 2008. Paty DW, Ebers GC. Multiple Sclerosis. Philadelphia: FA Davis Co., 1998. Weinshenker BG, Bass B, Rice GPA, et al. The natural history of multiple sclerosis: a geographically based study: I: clinical course and disability. Brain 1989;112:133–146. Miller DH, Khan OA, Sheremata WA, et al. A controlled trial of natalizumab for relapsing multiple sclerosis. N Engl J Med 2003;348:15–23. Randomised double-blind placebo-controlled study of interferonbeta1a in relapsing/remitting multiple sclerosis: PRISMS (Prevention of Relapses and Disability by Interferon beta-1a Subcutaneously in Multiple Sclerosis) Study Group. Lancet 1998;352:1498–1504. Johnson KP, Brooks BR, Cohen JA, et al. Copolymer 1 reduces relapse rate and improves disability in relapsing-remitting multiples sclerosis: results of a phase III multicenter, double-blind placebo-controlled trial: The Copolymer 1 Multiple Sclerosis Study Group. Neurology 1995;45:1268–1276. Rice GPA, Ebers GC. Interferons in the treatment of multiple sclerosis: do they prevent the progression of the disease? Arch Neurol 1998;55:1578–1580. Ebers GC. Preventing multiple sclerosis? Lancet 2001;357:1547. Johnson KP, Brooks BR, Ford CC, et al., Copolymer 1 Multiple Sclerosis Study Group. Sustained clinical benefits of glatiramer acetate in relapsing multiple sclerosis patients observed for 6 years. Mult Scler 2000;6:255–266. Goodkin DE. Inter and intra observer variability for grades 1.0-3.5 of the Kurtzke Expanded Disability Status Scale (EDSS). Neurology 1992;42:859–863. Kappos L. Effect of drugs in secondary disease progression in patients with multiple sclerosis. Mult Scler 2004;10:S46–55. Randomized trial of interferon beta-1a in secondary progressive multiple sclerosis: 1: clinical results: SPECTRIMS Study. Neurology 2001;56:1496–1504. Placebo-controlled multicentre randomised trial of interferon beta-1b in treatment of secondary progressive multiple sclerosis: European Study Group on interferon β-1b in secondary progressive MS. Lancet 1998;352:1491–1497. Jacobs LD, Cookfair DL, Rudick RA, et al. Intramuscular interferon beta-1a for disease progression in relapsing multiple sclerosis: The Multiple Sclerosis Collaborative Research Group (MSCRG) [erratum 1996;40:480]. Ann Neurol 1996;39:285–294. Fillipini G, Munari L, Incorvaia B, et al. Interferons in relapsing remitting multiple sclerosis: a systematic review. Lancet 2003;361:545–552. Lublin FD, Baier M, Cutter G. Effect of relapses on development of residual deficit in multiple sclerosis. Neurology 2003;61:1528–1532. Rio J, Nos C, Tintore M, et al. Assessment of different failure criteria in a cohort of relapsing-remitting multiple sclerosis patients treated with interferon B: implications for clinical trials. Ann Neurol 2002;52:400–446. Cottrell DA, Rice GPA, Hader W, Baskerville J, Koopman WJ, Ebers GC. The natural history of multiple sclerosis: a geographically based study: 5: the clinical features and natural history of primary progressive multiple sclerosis. Brain 1999;122:625–639. Liu C, Blumhardt LD. Disability outcome measures in therapeutic trails of relapsing-remitting multiple sclerosis: effects of heterogeneity of disease course in placebo cohorts. J Neurol Neurosurg Psychiatry 2000;68:450–457. Rudick RA, Goodkin DE, Jacobs LD, et al. Impact of interferon beta-1a on neurologic disability in relapsing multiple sclerosis: The Multiple Sclerosis Collaborative Research Group (MSCRG). Neurology 1997;49:358–363. Francis DA, Bain P, Swan AV, Hughes RA. An assessment of disability rating scales used in multiple sclerosis. Arch Neurol 1991;48:299–301. Noseworthy JH, Vandevoort MK, Ebers GC. Interrater variability with the expanded disability status scale (EDSS) and functional systems (FS) in a multiple sclerosis clinical trial. Neurology 1990;40:971–975. Noseworthy JH, Ebers GC, Vandevoort MK, Farquhar RE, Yetsir R, Roberts R. The impact of blinding on a randomized double blind placebo-controlled multiple sclerosis clinical trial. Neurology 1994;44:16–20. Rudick R, Antel J, Confavreux C, et al. Recommendations from the National Multiple Sclerosis Society Outcomes Assessment Task Force. Ann Neurol 1997;42:379–382. Interferon beta-1b is effective in relapsing-remitting multiple sclerosis. I. Clinical results of a multicenter, randomized, double-blind, placebo-controlled trial: The IFNB Multiple Sclerosis Study group. Neurology 1993;43:655–661. Schwid S, Thorpe J, Sharief M, et al. Enhanced benefit of increasing interferon beta-1a dose and frequency in relapsing multiple sclerosis. Arch Neurol 2005;62:785–792. Sheridan C. Fast track to MS drug. Nat Biotechnol 2004;22:939–941. Noseworthy JH, Vandervoort MK, Hopkins M, Ebers GC. A referendum on clinical trial research in multiple sclerosis: the opinion of the participants at the Jekyll Island Conference. Neurology 1989;39:977–981. Noseworthy J, Kappos L, Daumer M. Competing interests in multiple sclerosis research. Lancet 2003;361:350–351.